Valverde knows Spanish soccer extremely well, having spent all of his playing career and a majority of his managerial career in Spain. Valverde made a name for himself during his playing days with Athletic Bilbao, where he made 170 of his 320 professional appearances and scored 44 of his 77 professional goals. His play, accompanied with his managerial stints there, have him in club legend status. This also isn’t the first time Valverde will be at Barcelona either. He spent 1988-1990 with the Catalan club, making 22 appearances and scoring eight goals during his time with them. 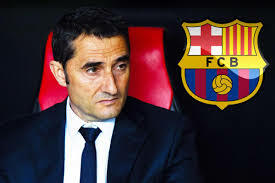 Valverde has also had a very successful managerial career, both in and outside of Spain. The only club he managed outside of Spain, Olympiakos, won the Greek title three times under Valverde. And while he hasn’t wont a multitude of trophies in Spain, he has garnered respect from everyone around La Liga by consistently having his teams exceed expectations. For instance, Athletic Bilbao finished seventh in La Liga this season, higher than many thought they would. In the last four seasons under Valverde, Bilbao never finished lower than seventh in the La Liga table. During his time there they finished fourth, seventh, fifth and seventh again this season. Bilbao also won the Supercopa de Espana under Valverde in the 2015-16 season.